An increasing number of people (young & old) complain of forgetfulness so often that it is just brushed aside after an apology. Most of the time, the forgetfulness stems from being disorganised. With information overload in today's world, we cannot remember everything. 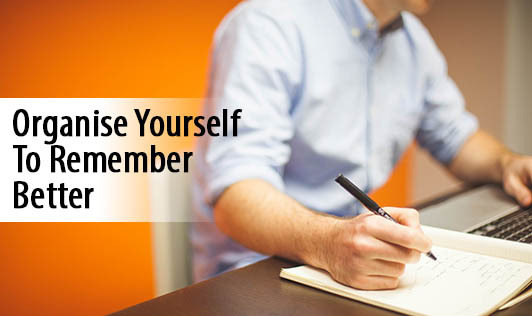 So, use lists, reminders, calendars and other aides to help you remember your activities and appointments. Develop routines to remember better. Leave your keys, glasses, mobiles and purses in the same place daily so that you don't search for them at the last minute. Pay attention when people talk to you. Don't get distracted by television, phone calls, messages, emails, etc. Label your personal belongings so that it makes it easy to find them, especially if you live or work in a group. Associate stories with new ideas or new things in your life. Helps to recall and remember better. Visual memory is usually better than audio memory. Store important information for later use. Delegate work whenever possible so that your mind and time are not cluttered with tasks. Communicate clearly and correctly with your family, friends and colleagues. This itself helps you to remember better. Lifestyle changes are always important in every aspect of your life including better memory. So, sleep well, exercise daily, eat healthy and unwind regularly.